I for one am looking forward to this annual game of jepordy and success! yes I know I'm mad but I regard serviving in the stacksfullcrash league a success for our unfashionabl club. Please address insults to your nearest bin. Possible. But very unlikely that ALL of the five teams above the bottom 2 will get more points than us in the last games. Or.. You could look at the teams below and see that we create more than them and have a better defensive record than most, with our goal difference better than all. 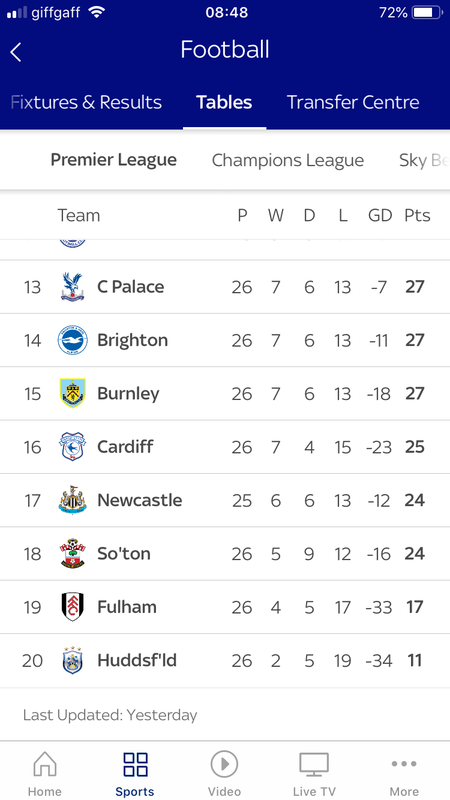 We’ll be fine, we only need 11 points from 12 games with the teams in and around us all coming up. Brighton are in free fall and Southamptons New Manager syndrome has run out. I remember when we needed one win from 4 and wba needed four wins. Something like that. It's not entirely beyond the realms of possibility but we'd have to severely go off the boil to be in trouble now. A point a game would see us through and if anything we've been unlucky not to get more from recent games. Case in point yesterdays game. The teams around us are hardly setting the world alight. Always possible but ‘a real possibility’ - NO ! Not a real possibility. It’s very unlikely. We’re well organised, hard to breakdown, look motivated, have quality players, create chances. I’m confident that either Big Ben or Michy will be firing soon and I think it’s more likely we’ll be knocking on the door of the top 10 by the end of the season. All the teams below are picking up points currently but neither of them are as good us. 5 have to overtake us. Not likely. The plight of Brighton is very satisfying. With their form, they should be worried. Would like to see the thugs from Southampton with that **** Ward Prowse go down.